Funny You Should Think That! 4 – September 28! 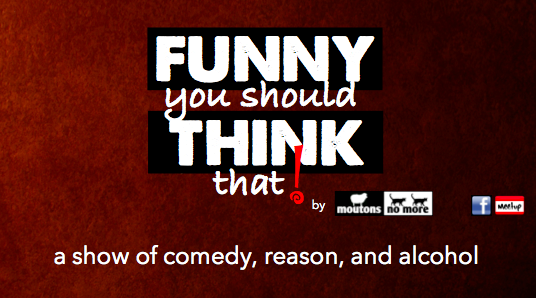 As promised, our stage show, Funny You Should Think That!–in which Moutons No More bring you evidence-based entertainment–returns at the end of the month, so mark your calendars… or phone planners… or Remember the Milk app. September 28, from 5:00 PM until, well, midnight (for Andrew, at least, and anyone willing to follow him into the alcohol-drenched abyss), we will be bringing you the latest instalment of our show, under the creative guidance of Andrew, at a brand-new location! We’re coming out of the basement and moving into the penthouse. Come see us in Old Montreal, close to Champs-de-Mars metro station, at one of the best known pubs in town: Pub St-Paul. We are taking over the third floor to bring you a night to remember.